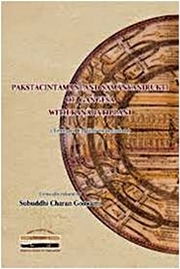 The present text comprising Cintamani Mula and Kanadatippani on the topics of Paksata and Samanyanirukti belongs to the literature of Navya-Nyaya. Samanyanirukti means the general definition of Hetvabhasa i.e., feigned reason formulated by Gangesa Upadhyaya in the Anumana-section of his Tattvacintamani. After this, there are sections on specific definitions of feigned reasons like Sadharana, Asadharana, Viruddha, Asiddha (three varieties), Satpratipaksa and Badha etc. Texts of these specific definitions are not covered by the present author under the DRS project of Sanskrit Department, R.B.U. and they are published as fascicules by the concerned authority, The aim of Navya-Nyaya is to formulate a correct definition of a concept free from all sorts of faults like absurdity (asambhava), over-application (ativyapti) and narrowness (avyapti) etc. Herein lies the peculiarity of Kanada’s writings. Paksata means a peculiar condition (psycho-objective) necessary for the emergence of inferential cognition. The aim of the text is not only to frame a fault-free definition of Paksata but also to establish the necessity of acknowledging such a condition in addition to other causes of inference. Prof. Subuddhi Charan Goswami is an eminent Sanskrit scholar and an authority on Navya-Nyaya school of philosophy. He was Head of the Department of Sanskrit and was the dean, Faculty of Arts, Director, School of Languages and Culture, R.B.U., Kolkata.